In what real life equation would you use volume? What kinds of things can you use volume for? What is the easiest way to find volume? How to use volume in the real world? Why is it called volume? Does a solid object have volume? When will we use it in our lives? How is volume related to math? How many combination of shapes can we put together to make a problem? Who came up with all the different volume formulas? Why does volume have to be so complicated? What shape is the easiest to find the volume of? Is there more than one way to find volume? Does the thickness affect it? How much would you use volume in real life? What is the order in how you find volume? Can you find the volume of anything? 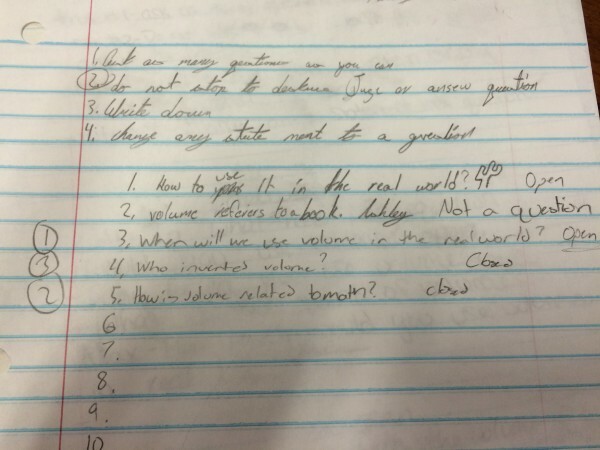 Questions were used to gauge how well the students had grasped the lesson on volume. What were your prioritization instructions? By asking the students to rate their questions on importance, I was assuming that those they rated the most important were the ones that they were the least familiar with because I listened in as they rated them and they rated the ones lower that they knew the answer to. I then used their questions to steer our review days, by looking over them and deciding what the questions told me about their level of understanding. For the group of students I have most of their questions were upper level or abstract, open-ended. 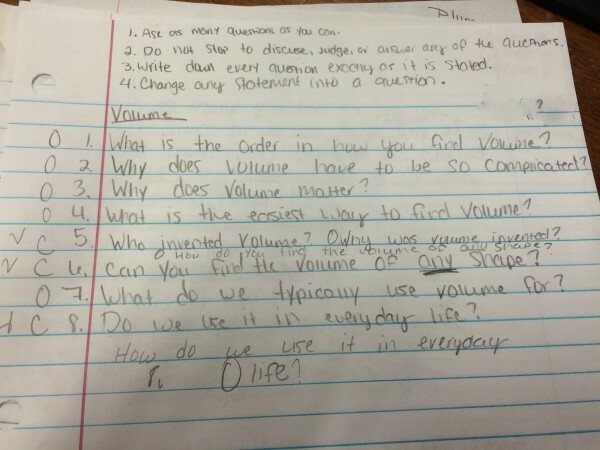 That tells me that they understood the basic elements of volume and that their questions were going above the level that we covered in class. So I used this information to review only with specific students while differentiating for others by having them go on Khan academy and trying volume problems that were more challenging than what we had covered in class.